ST. APOLLINARIS was the first Bishop of Ravenna; he sat twenty years, and was crowned with martyrdom in the reign of Vespasian. 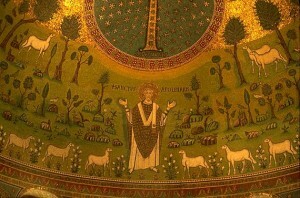 He was a disciple of St. Peter, and made by him Bishop of Ravenna. St. Peter Chrysologus, the most illustrious among his successors, has left us a sermon in honor of our Saint, in which he often styles him a martyr; but adds, that though he frequently suffered for the Faith, and ardently desired to lay down his life for Christ, yet God preserved him a long time to His Church, and did not allow the persecutors to take away his life. So he seems to have been a martyr only by the torments he endured for Christ, which he survived at least some days. His body lay first at Classis, four miles from Ravenna, still a kind of suburb to that city, and its seaport till it was choked up by the sands. In the year 549 his relics were removed into a more secret vault in the same church. St. Fortunatus exhorted his friends to make pilgrimages to the tomb, and St. Gregory the Great ordered parties in doubtful suits at law to be sworn before it. Pope Honorius built a church under the name of Apollinaris in Rome, about the year 630. It occurs in all martyrologies, and the high veneration which the Church paid early to his memory is a sufficient testimony of his eminent sanctity and apostolic spirit. Reflection.—The virtue of the Saints was true and heroic, because humble and proof against all trials. Persevere in your good resolutions: it is not enough to begin well; you must so continue to the end.